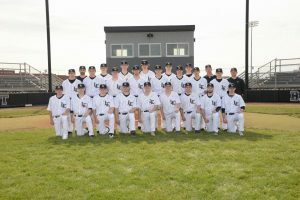 The Baseball staff is very excited about the 2019 season, as it should, as the Hawks have rushed out to an early season mark of 6-0 (5-0 in the GMC). This year’s team has 7 returning position player starters from 2018, which finished 2nd place in the GMC. With returning 7 starting position players, Mitchell Vincent, Sean Church, Will Koger, Christian Bodden, Grayson Hamilton, Garrison Hamilton (Ohio Dominican Commitment) and Devon Milburn. The Thunderhawks have a very talented returning core group that is very good defensively. Pitching is always the key to the success of any season and we have a great deal of talent at that position. The Thunderhawks have a very talented Pitching staff. This group includes Grayson Hamilton(Ohio Dominican Committee), Nathan Haberthier (Ohio State Committee) Andrew Bachman, Devon Milburn, Cole Talarek, Jake Fisher, Casey Berglund, and Trey Faglie . They will give the 2019 team great of depth and talent to compete in a league as talented as the Greater Miami Conference. The offensive and defensive projection are just as encouraging with the returning starters Will Koger, Sean Church, Mitchell Vincent, Devon Milburn, Casey Berglund and the addition of very talented players such as Cole Adams, Preston Dorsey, Andrew Gooding, and Dylan Risola. In the Outfield, we return, Grayson Hamilton, Garrison Hamilton, Christian Bodden and added Stone Shields, Ethan Crawford, and Max Mikkelson. The Thunderhawks return Kyle McDonough and Michael Sprockett to give depth and talent at the Catching position. Every season and team is different and we are very excited about the talent and depth on this team. They are a very close group and have very good leadership. We are looking forward to all the challenges that the GMC provides and playing some great baseball this spring. East is coached by Ray Hamilton.